Weather you call it a paraplane, powered para plane, parachute plane, motorized parachute, flying parachute, power parachute, PPC, UFO, big bird, or ultra light high flying fangled contraption, it still amounts to a lot of great flying fun, and that's what our company is all about. 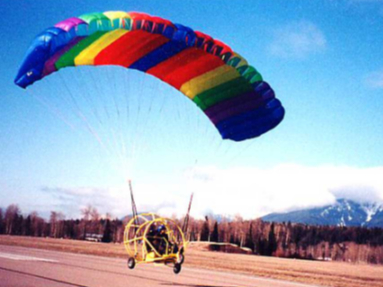 Sundog Powerchutes Inc. - Sundog Powered Parachutes, is a powered parachute manufacturer of a unique new design of powered parachutes. Our side by side powered parachute model is what we specialize in and what really sets us apart from most of the other powered parachute manufacturers, but we also manufacture a single seater as well. We have a nice selection of powered parachute pictures, and even a couple of powered parachute videos in our gallery section to give you a better idea of what this sport is all about.